The previous album was also released on Malignant and contains an excellent piece of “ambient noise”. Dark and thundering distorted sounds and a very good atmosphere. The latest album opens with a dark ambient track that is somewhat noisy and nicely dark. The rest of the album seems to lean more towards dark ambient than towards noise though. 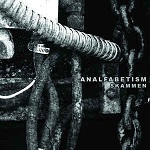 For a dark ambient album “Skammen” is still pretty noisy, but the previous album sounds (to me) more like an ambient version of noise. There is a very noisy outburst in the third track though that just may be loud enough to scare away some dark ambient lovers, but other tracks are too ambient, even ‘soundscapish’ for people who like noise. Overall the style is rawer and perhaps even more industrial than many dark ambient releases, so do not think that me using the term means that this sounds anything like Raison D’Être. I personally found “Av Hjord Är Du Kommen” much more convincing, the new new album is still a descent one if I feel more ambient some time.